With regards to the purchase of a new car the two-legged Sarah Dooley advised us to "go big or go home" in the comment section of this blog, and I can't wait to inform her that we took her advice. 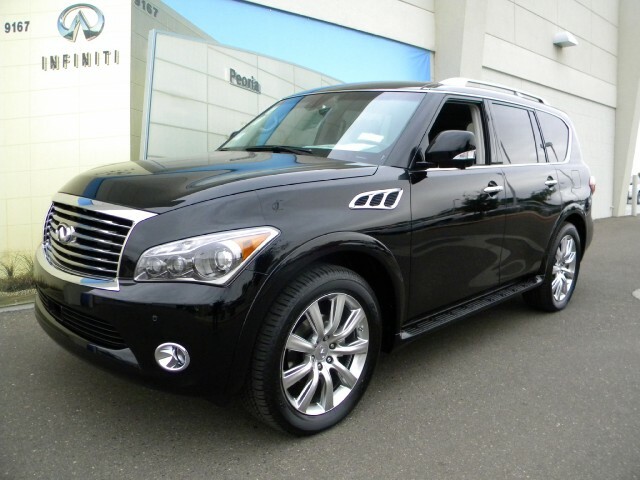 On the last day of 2010 the husband and I purchased a 2011 Infiniti QX56. We traded in my husband's 9-year-old Chevy Tahoe for this phenomenal SUV. It is the first time I've owned a brand spanking new vehicle, which is thrilling. It's so thrilling that I insisted that we drive my 2004 4Runner to yoga today, because I didn't want our post-yoga sweaty bodies to touch my husband's new QX. It's so thrilling to own a new car that today I also insisted that we take my 2004 4Runner to the grocery store, because I didn't want to mess up my husband's new QX. After we got back from the grocery store my husband informed me that we'd have to eventually drive his new car. I just like to go out to the garage and look at it in all it's pristine newness. I can't believe we have such a badass car in our garage. Hooray! It looks awesome! It also matches Dooley, which is a bonus.